The following article was published in Manila Standard Today on Dec. 11, 2010, in their Diaspora section. I wake up; our bedroom was freezing. I rise and crank up the heater so I can at least feel my toes. I clear the frost in my windowpane to take a look outside. It has been snowing all night and the snow has not relented, blanketing everything, surrounding us in white. The snow in the ground was getting deeper, so I decide it is time to shovel and clear up our driveway before we get buried inside. As I put my thermals, sweater, parka, hat, muffler, snow boots, and gloves on, I hear Bing Crosby on the radio singing: “I’m dreaming of a White Christmas, just like the ones I use to know.” My mind wanders. I first heard “White Christmas” many, many years ago while growing up in the streets of Manila. I had no idea what a white Christmas was then, but it did not stop me from singing that song. I like the part “to hear sleigh bells in the snow” even though I had no clue what sleigh bells were. Now I understand why the Philippines can only dream of a white Christmas — unless our planet Earth go into another ice age. The first time I experienced snow was quite memorable. I was so excited to see snow coming down from the sky that I ran out of the apartment with barely a jacket on. I like the way it felt and tickled my face and tongue as it gently falls. I scooped up a handful from the ground with my bare hands and made a snowball. Not too long after, though, I started shivering and my hands turned to white and then blue from the biting cold. I had to run back inside for shelter. But it was a beautiful sight to see when all the ground is white, glistening under the moonlight, and reflecting the Christmas lights. That was the first time I felt like living inside a Christmas card. Not too long thereafter, I experienced my first blizzard. It did not stop snowing for a couple of days until the snow was almost three feet deep. It buried our town. I was stranded in my workplace for 2 days. My wife and I were so ill-equipped for snow at that time. We had no snow boots yet, so we tied plastic bags to cover our rubber shoes when we went out and walked in the nearly waist-deep snow. Then we used a broom and a dustpan to excavate our car which was virtually submerged in snow. It was a good thing that after some time of digging with a dust pan, a good neighbor saw us and lent us a real snow shovel.Still, it took us more than an hour to get our car free. Now, after years of living in an “icebox” and dealing with bone-chilling cold winter, I am sick of clearing and shoveling snow. I am also tired of driving, or should I say slipping and sliding, through snow, sleet, and ice. Now I feel I should drive a sleigh (only with sleigh bells of course) pulled by reindeers when the road is covered with snow. I even got stuck in the snow once and needed my car pushed and towed. And in days like these, a white Christmas is the farthest thing I’m dreaming of. What I am dreaming of? I am dreaming of a WARM Christmas! Just like the ones I use to know. 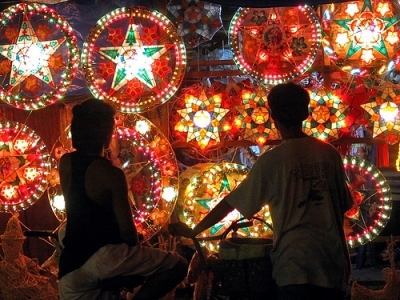 I am dreaming of a place where I can hear the distant church bells ring in the early morning calling for the “simbang gabi”, where I can smell the freshly cooked puto bungbong and bibingka being prepared at the corner street, where I can see the bright and colorful “parols” and their “kumukutikutitap” lights, where I can hear the street children sing “Ang pasko ay sumapit” while beating their makeshift drums made of tin can and clanging their bottle crowns (“tansan”), where I can taste the arroz caldo, kare-kare, and relyenong bangus prepared in our home, where I can share with the joy and laughter of my childhood friends, where I can feel the warm embrace of lolo, lola, tito, tita, kuya, ate, tatay and nanay, where I can……. The blast of the Arctic air snapped me back to the reality of the present, as I open the door to go outside. Yes, I am cold, and very, very far away from the warm place I always known as home. I was so homesick, feeling sorry for myself. 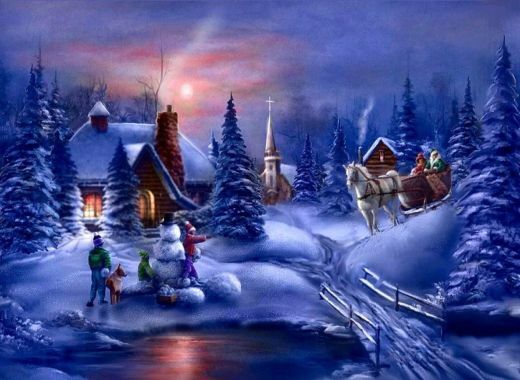 Then a thought occurs: being far away from home is the very essence of the first Christmas — when Jesus left the comfort of His heavenly home and came to this lowly planet and spent His first night here on earth, in a humble and cold stable. On this holiday season, wherever you are, home or far away from home, I wish you a merry and blessed Christmas.